Kids and Adults Military style dog tag medical alert necklace comes with the medical emblem laser engraved on the front and custom engraving on the back. The paracord is Army Green and adjustable from 30 inches to 15 inches! This tag is anodized aluminum and comes with a black silencer. 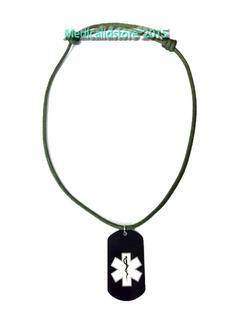 The medical id dog tag measures with silencer 1- 1/4 x 2-1/8. Comes in several different colors and always free engraving.